Prabu Naidu holds a University of London Masters in Organisational Behaviour and gained 19 years of MNC experience (1980-1999) with Philips, AT&T and Compaq that spanned diverse functions in Engineering, Materials, Project Management, TQM, HRD, Managing Change and Supply Chain Re-Engineering. These set the foundation for his current twelve years (2000-2011) of training, facilitation and consulting work in organisational development. He has a reputation for being highly engaging and versatile in adjusting design and delivery of his sessions to the emerging needs of the situation. He has facilitated international and regional meetings and conferences for International NGOs in addition to numerous Organisation Development interventions for MNCs, SMEs, VWOs, NPOs, and Singapore public sector agencies. 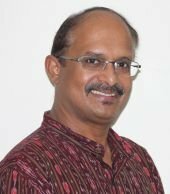 He is an IAF Certified Professional Facilitator (CPF) and an INIFAC Certified Master Facilitator (CMF). He co-founded Facilitators Network Singapore in 2004 with Janice Lua to upscale the competencies of facilitators in Singapore and the region and writing SPOT on Facilitation is part of that mission.